When the first trailer for the new Pierre Morel (Taken) film premiered a few months back I didn't feel inclined to really highlight it given it seemed little more than an attempt by Sean Penn to copy the same success Liam Neeson found in Morel's 2009 thriller. That success only came about as it was different and unexpected, lightning in a bottle if you will that rarely strikes twice (just ask Kevin Costner and Guy Pearce). With the latest trailer for the film though this looks less and less like a generic action thriller and more along the lines of something akin to Penn's 2010 flick, Fair Game. Based on the novel by Jean-Patrick Manchette this seems closer to a man on the run-type story where Penn is dealing with the dynamics of his role in the bigger scope of the organization he works for rather than a simple, catch the bad guys premise. In short, this seems to be a little more complex which is expected given Manchette was a French crime novelist who was credited with reinventing and reinvigorating the genre. It should also be noted that Morel didn't helm either of the horrible Taken sequels and that his keen sense of action and intimate character development could push this past the immediate generic vibe you take away from both the title and the trailer. It is also not just one well known, pedigreed actor in action here, but several. With a strong cast led by Penn who looks on point as a military contractor suffering from PTSD I'm optimistic this could turn out to be better than most are expecting. The Gunman also stars Javier Bardem, Idris Elba, Ray Winstone, Jasmine Trinca, Mark Rylance and opens March 20th. 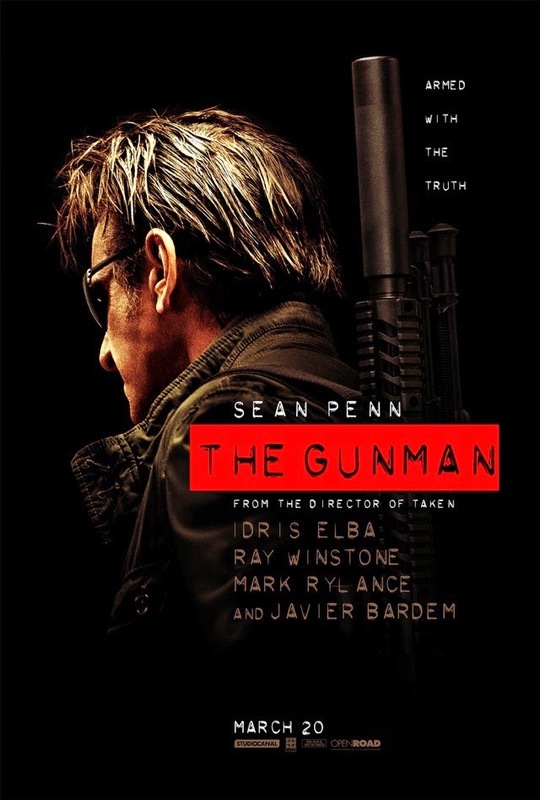 Synopsis: In THE GUNMAN, Sean Penn stars as a former special forces soldier and military contractor suffering from PTSD. He tries to reconnect with his long time love, but first must go on the run from London to Barcelona and across Europe in order to clear his name. The film also stars Javier Bardem, Idris Elba, Ray Winstone, Mark Rylance and Jasmine Trinca. Based on Jean-Patrick Manchette’s novel The Prone Gunman, THE GUNMAN was directed by Pierre Morel (Taken, The Transporter franchise). The film was produced by Joel Silver, Andrew Rona and Sean Penn and executive produced by Adrian Guerra and Peter McAleese.